Win a FREE Custom Aisle Runner! Get Ready . . .It’s almost Annual Sale time! It almost that time of year again . . . Annual Sale time! Who hoo. we love it when our summer brides get to save 20%* off their custom aisle runners just for ordering a little bit early. It’s a win-win. Get your aisle length and design details ready. Donn’t miss out since this is our only sale before the 2017 summer wedding season. Sale runs February 27, 2017- March 1, 2017. Ready to Walk Down Crushed Diamonds? Crushed diamonds is exactly what so many of our client’s have called our fully glittered aisle runners and we can see why. We hand blend all of our glitter colors so we can match your ceremony decor perfectly. While we are at it, we can even embed your monogram or favorite quote into your glitter aisle runner for the truly custom ceremony. Simply call our studio at 973-744-7070 to get started today creating your dream wedding ceremony. One Wedding – – Two Installations – – One Runner! There is nothing like being able to use something you LOVE more than once. What if you could take your custom Original Runner from the ceremony to the reception? This client did just that and all of her were just wowed! Have two Grand Entrances on your big day too. How Do We Hand Paint a Custom Runner? We get curious questions all the time as to whether we REALLY hand paint our custom aisle runners and of course the answer is YES! Our truly talented team (we love alliteration) of artists can replicate any design on our exclusive nonslip fabric aisle runners. Take just a few minutes to check out how we hand paint a custom crest aisle runner. Perfect for the wedding ceremony and for framing after the big day! Can you name that movie? Our clients ask us to replicate just about everything on our custom nonslip aisle runners but this quote is a first for even us. The guests threw pom poms at the happy couple during the recessional . . . so cute! Can you name the movie where this classic line came form? We love dual purpose aisle runners! We really love when our savvy brides find dual purposes for their custom aisle runners. Take it from your ceremony aisle and the it can be used as a banner or table runner with just two minutes of installation. Even better, you can then have the custom portion of the runner framed or stretched over a canvas after the big day as the perfect memento for your home. Everyone loves a great Love Story so why not make yours part of the big day?! We are so excited about this really cool project we are working on this week. A “Story of Us” timeline aisle runner for a very special couple who were high school sweethearts. Celebrate each memorable moment of your relationship with a timeline of your love too! Small Detail . . . Big Impact! We are Ga Ga for Glitter! We just adore adding a little (or a lot ) of Glitter to our custom aisle runners. Here are just a few recent runner projects that will added the right amount of bling to the big day! Fall in Love with this Fall Leaves Runner! As the season begin to change, autumnal themed-weddings become all the rage. The perfect detail for these weddings is a fall leaves aisle runner! Want it to look like you are walking through a path of freshly fallen leaves? Then we have you covered without the hassle and stress of actual leaves! Make your outdoor wedding a little less messy, or bring those autumn vibes indoors with this unique runner! These runners are an incredible deal at 25% off while supplies last! Check them out on our website HERE. Halloween is on a Saturday night this year which means there will be a lot of weddings on All-Hallows-Eve. But just because the mood is spooky doesn’t mean there isn’t love in the air! 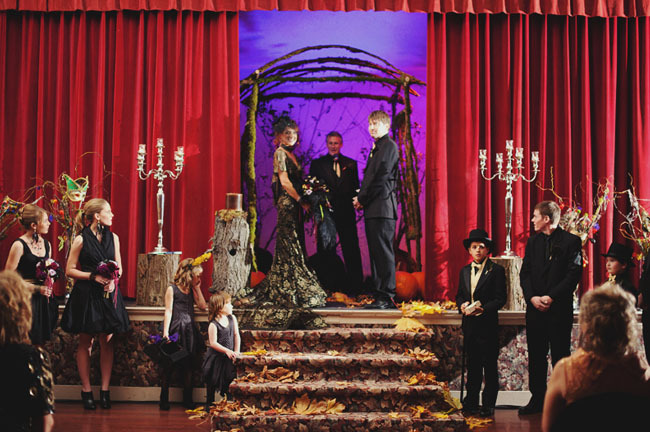 We found some fun Halloween themed weddings to inspire your Hallo-Wedding! © 2017 The Original Runner Co.